PUNTA GORDA – November 2, 2016 – Farr Law Firm is honored to be included in the U.S. News – Best Lawyers® 2017 “Best Law Firms” report, receiving a Tier 1 ranking for outstanding work in trusts and estates and real estate law in the Fort Myers metro area. 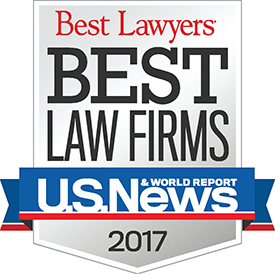 To be ranked, a firm must first have a lawyer listed in The Best Lawyers in America, which recognizes the top 4 percent of practicing attorneys in the United States. Earlier in 2016 Guy S. Emerich and Jack O. Hackett II, directors at Farr Law Firm, were selected by their peers for inclusion in the 2017 Edition of The Best Lawyers in America©. Emerich was recognized by Best Lawyers© for his work in trusts and estates and received this honor for the eleventh consecutive year. Hackett was named by Best Lawyers© in the practice of real estate law. “This recognition speaks to the high quality of service and legal representation that we provide to our clients across multiple practice areas. Many of our attorneys are among the most accomplished in their field anywhere in the State of Florida,” said firm president David A. Holmes.